The IBM 4610 is a SureMark Point of Sale Printer that offers high performance and high function in a very compact package. It provides point-of-sale users with significant improvements in printing speed, quiet operation, open interfaces, and exceptional usability. These SureMark printers excel in flexibility by providing two printing mechanisms in one product. The thermal customer receipt station provides quiet, fast receipt printing. The impact document insert station provides printing of multi-part forms plus check printing and franking. When you add the SureMark's state-of-the-art check handling features, MICR reading and IBM's exclusive single pass check printing and franking, you have a printer that improves a retail operation's bottom line through shortened transaction times and improved customer service. Drop and load paper handling coupled with easy to load ribbon cartridges minimizes operator training time. The single pass check handling feature reads the MICR, franks the check, and prints the face of the check, all with a single insertion into the printer. This frees the operator to attend to the customer's needs, shortening the overall transaction time. Because the 4610 supports modular interface adapters, retailers have the flexibility to attach the printer to the platform that best meets their needs and ensures that their printer investment is protected. Today, RS-232 and RS-485 are available. The modular interface will enable retailiers to migrate to new technologies, like USB, when they become available. Combining fast print speeds (up to 52 lines per second) with high print quality, the ability to print logos and coupons, and resident barcode capability, the SureMark Thermal/Impact Printer is the product of choice for point-of-sale applications. Non-volatile memory (256KB) is resident in the printer to store fixed print data (graphic data such as logos and coupons), downloaded fonts and code pages, and it may also be used to store transaction data. Imagine the possibility of printing receipts which communicate marketing information to customers, in less time than it takes to print a plain receipt today. The IBM 4610 SureMark printers can also emulate model 3 and 4 printers. Customers can replace the older model printers with 4610 SureMark printers and immediately reap the benefits of fast, quiet printing without any significant software changes. The IBM 4610 Model TI3 is the standard model, which features receipt and document insert printing with two-step check franking and printing. Retailers are continually looking for ways to improve customer service and reduce transaction times. The SureMark printer can do both. The speed of the receipt printer (up to 52 lines per second) coupled with the printer's non-volatile memory now enables retailers to improve and expand customer receipt data while at the same time improving throughput. These receipt data improvements are achieved by waiting until the end of the transaction to print the receipt rather than printing after the entry of each individual line item. This is enabled by the fast print speed of the SureMark printers. Combining like items so the customer doesn't have to search the entire receipt to see if he was charged for more items than were actually received. Putting coupon information directly below the appropriate item so there is no confusion as to whether or not the savings were given. Printing a receipt that is sequenced with all items purchased from a given department together, for customer convenience. Printing a coupon with a percentage off the next purchase to encourage the customer to return to the store. The quietness of the thermal receipt station improves customer satisfaction by eliminating printer noise that may annoy customers while waiting in line. This noise reduction also enables better communication between the cashier and the customer. The SureMark printers provide the IBM RS-485 interface as implemented on the IBM 4680 and 4690 POS systems, and the RS-232 interface. Because these interfaces are provided on each printer, customers can choose the terminal platform that is best for them today with the knowledge that their printer investment is protected if they choose another platform in the future. In addition, customers with mixed terminal platforms can now roll out the same printer across their entire enterprise, thus enabling common printer training processes across the entire enterprise. Because the 4610 can emulate currently installed model 3 and 4 printers, customer' software investments are protected. When customers are ready to take full advantage of the 4610's capabilities, they can do so without changing hardware. The drop and load paper handling and easy-to-load ribbon cartridge of the SureMark printer improves operator efficiency by reducing the amount of time needed to change printer consumables. To load paper in the SureMark printers, the operator simply drops the paper into the paper bucket with the edge of the paper extended on the feed roller, closes the top cover, and proceeds with the transaction. Usability improvements like these help reduce transaction time at the register and have a direct impact on customer service. The print speed of the thermal receipt station (up to 52 lines per second) not only speeds up the transaction time but also gives retailers the flexibility of using the receipt as an advertising tool. The speed enables retailers to print their unique logos, coupons and sales information on the receipt while still improving transaction time at the register. Retailers can now tailor the receipt to uniquely identify their store over other retailers. Barcodes can be generated within the printer via simple datastream commands, improving throughput over application-generated barcodes. Non-volatile memory in the printer enables performance enhancements when printing logos, fixed messages and coupons on a receipt. Rather than repeatedly sending the same data to the printer, the application just needs to identify which logo/message, etc. to print out of printer memory. The SureMark Model TI3 printer is designed for retailers who have implemented or plan to implement electronic journaling. There is no physical journal station in these printers. They are targeted to image-conscious retailers who require quiet printing at the front end of the store and need faster transaction times at the POS register. These printers will also appeal to retailers who wish to take advantage of an opportunity to market to their customers by using the printer's stored image capability for coupons and product logos. The models 3, 3R, 4 and model 4R printers and printers meeting fiscal requirements will continue to be available for retailers who continue to use paper journals, require 86 column document insert or must meet governmental fiscal requirements. Note: (1) MICR read, check franking and check printing in one pass. Increased data transmission packet size to 1024k bytes (RS485) enabling higher performance. The capability may not be utilized by all of the individual applications and/or operating systems. New microcode required to operate the TI3/4. The microcode between the TI1/2 and the TI3/4 is not compatible. The TI3/4 has an increased memory allocation of 16kB to store in-coming commands and data, as compared to 4kB on the TI1/2. This increased memory enables more effective printing of graphics images like captured signatures. The total amount of data space available for the download of graphic messages is 65,136 bytes for the TI3/4 vs. 65,376 for the TI1/2. When the thermal receipt station prints at >60% dot utilization, the printer will automatically decrease it's speed in order to maintain an acceptable power consumption level. Code Page 858 is now resident in the TI3/4. Code Page 858 contains the Euro Character symbol. Code Page 850 is not resident in the TI3/4. The TI3/4 has a device ID of "01" and the TI1/2 maintains its device ID of "00". The entire 4610 Printer family maintains it's printer address of HEX 35. The TI3/4 has a newly designed font. The new font is designed to be more user friendly and higher quality when printing at the increased speed of 52 lps. A new printer utility has been developed to support the TI3/4. See IBM's Retail Store Solutions Internet site for details about the utility, and to download. The TI3/4 has a new High Quality command designed to allow flexibility in the print speeds of the thermal receipt. The print speed of the printer can be altered by using this new command. See the 4610 ser's Guide for additional details. Continuous multiple line printing of logo messages allows for the implementation of Signature Capture printing. The TI3/4 has implemented a new modular interface card design that is not backwards compatible with a TI1/2. The new design contains an easy access " trap door" which makes replacing/upgrading the interface card an easy operation for customers. To support the new interface card design and the increased print speed, a new main logic card has also been implemented on the TI3/4. Again, this main logic card is not backwards compatible with a TI1/2. RAM capacity has increased from 32kBx16 in the TI1/2 to 128Bkx16 in the TI3/4. The TI3/4 contains a set of mechanical components that are not backwards compatible with the TI1/2 (thermal printhead, drive clutch, receipt motor). The TI3/4 has added a new Machine/Model/Serial Number label to the front cover, making it easier for customers to locate the information needed for servicing the product. The power consumed by the TI3/4 is moderately increased as compared to the TI1/2. The power consumption is proportional to the speed of printing and dot utilization. The only difference to the user/application for 4690 OS is that the TI1/2 microcode update file is named ADXPJPUF.DAT and for TI3/4 is named ADXPJPFF.DAT. The OS uses the file based on the second byte of the device ID info (0x00 = TI1/2, 0x01 = TI3/4). See the Software Requirements section of this Sales manual for a listing of the required software levels for support of the 4610 TI3/4. The Windows driver has increased it's data transmission packet size to 1024kB of data for the TI3/4. IBM 4610 Point of Sale Printers are customer setup products. 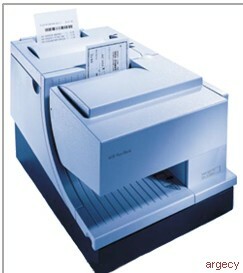 The IBM 4610 Point of Sale Printers support attachment of two IBM cash drawers. The publication language may be specified. See "Publications" and "No Charge Specify Codes." The thermal printhead is an in-line type with 576 heating elements. No scheduled maintenance is required. The printhead is not a customer replaceable part. Thermal printing occurs by placing a heating element against a thermally sensitive paper and by energizing the elements. Thermal printers print dot rows horizontally across the page, with 576 dots making up a single dot row across the paper. Printing continues row by row until the entire character is formed. The thermal printhead is protected from overheating conditions through a duty cycle algorithm which slows printing after a preset thermal limit is reached. Normal text will print at full rated speed, but the densest graphics patterns may cause the printer to reduce print speed. The 4610 prints the customer receipt using the thermal print head. Documents are printed using the impact head. Note: POS grade thermal receipt paper is recyclable. The document insert station uses an impact printing mechanism with a nine wire ballistic print head whose wires are oriented at a 45 degree angle. As the head transverses in a horizontal direction some or all of the wires are energized to form the various parts of the character. The SureMark printers will accommodate single and multi-part forms (up to 3 parts). The maximum thickness of multi-part forms is 0.47 mm. The maximum thickness of the front sheet of the multi-part form is 0.08 mm. Wider and longer forms may be used if they are not to be printed on both sides with the single pass feature. The recommended ribbon is the Epson ERC 35. Several manufacturers offer replacements for the Epson ERC 35; among these are Infotech, Inc. (P/N RE35P - specify Black or Purple). Average ribbon life is 3 million characters. Additional code pages (two thermal and one impact) may be downloaded if needed. Non-volatile Flash Memory is used for multiple purposes. Fixed messages are those that are printed on each receipt in a POS environment. Storing these messages in the flash memory greatly reduces the data transmission time to the printer and processing time of that data by the microprocessor. This is also true of graphics or APA messages which require a significant amount of transmission and processing time. Flash memory can also be used as a storage place for customer data. This data could be Journal data and would be placed in E-journal data storage as a temporary storage place in the event of a terminal offline condition. The SureMark printers feature modular interface adapters including a standard RS-232 and a IBM RS-485 interface. The RS-232 supports 9600 and 19.2 KBaud rates. The RS-485 operates at a 187.5 KBit data rate and provides for transmission of both power and signal. 4610 Models TI3 and TI4 support modular interface adapters. This will enable customers to easily migrate to new technologies like USB, when they become available. Removal and installation of interface adapters is a customer setup operation. A single cash drawer port is also provided. Two cash drawers can be supported with a "y-cable". Because there is no physical journal station on the SureMark Model TI3, an electronic journaling application is required. Electronic Journaling eliminates the need to store paper journal tapes and the time-consuming task of searching paper tapes should the need arise. When the customer is ready to take full advantage of all SureMark features, such as printing clean receipts, barcodes, etc., rerun the latest 4610 utility diskette and reload the terminals. Printing the face of checks requires application changes. (Franking the back of checks should not require changes). Printing wide documents may require changes. The document station on the model 4 printer supports 86 characters, while the SureMark supports 47 characters. Journal commands can be ignored or stored in the printer's flash memory. This needs to be decided when the printer is initially configured. During normal operations, journal commands are never sent to the printer since it requires an Electronic Journaling application and has no physical journal station. If the application is set up to send journal data to the printer (for example, if the terminal goes offline) the customer can configure the printer to store the data in the printer's flash memory. The electronic journal data needs to be retrieved manually using a sequence of buttons on the printer. The data is printed to the customer receipt tape. There is no top document registration (documents must be inserted from the front). User defined special characters are not supported. Emulation mode does not support the model 4 double byte character set. Emulation mode is currently supported on 4690 and DOS systems. 4690 OS level 9740 or greater is required to use this utility. When ordering 4610 SureMark printers for connection to 4694 Models 004 and 024, a prerequisite no-charge feature may be required for attachment to those 4694 models. For complete details of this requirement, refer to the 4694 Sales Page Hardware Requirements section and the model descriptions for Models 004 and 024. Communication cables are available for RS-232 and RS-485 attachment. Drivers are available for attachment of the SureMark printers to the following systems through the RS-485 port. RS-232 attachment is available on 4693, 4694, and 4695 as well as other vendors' terminals, or personal computers, and does not require a driver. 4690 OS does not provide support for RS-232 attachment. If the RS232 interface is used, there are no drivers required. IBM provides application support in 4680/4690 General Sales Application, 4680/4690 Supermarket Application, Chain Sales Application, SUREPOS ACE and Retail Application. IBM 4680 Chain Sales Application - product number 5669-212, maintenance level 9701. PRPQ P85534 (5799-QYP) is required. IBM 4680-4690 General Sales Application - product number 5696-546, maintenance level 9701 plus APAR IR32554. PRPQ P85533 (5799-QYN) is required. IBM 4680-4690 Supermarket Application - product number 5696-536, maintenance level 9701 plus APAR IR33229. PRPQ P85532 (5799-QYL) is required. IBM Retail Application - 5696-539. The SureMark printer model TI3 uses the same RS-485 interface as Model 3 and 4 printers. The program interface is changed from that of the previous printers. The SureMark Printers can emulate the model 3 and 4 printers. See Technical Description for more details. The User's Guide will be shipped with the printer if feature number 9521 is specified. Only ONE of each per store is recommended. The following publications are available at general availability. To order, contact your IBM representative. Specify feature codes, when ordered for field installation via MES, are billable to the customer unless ordered with a chargeable feature. (Color and voltage changes are always billable.) If price is not in the price file, an RPQ should be submitted. A no-charge specify code, #9521, can be selected with each model ordered to indicate that a User's Guide should be shipped with the order. Specify #9526 if no User's Guide is required. Only one per site is recommended and this is available only on the initial order. Power Supply - RS-232, feature #4930, is a universal type which will automatically accept both high and low voltages. The country code of the order will be used to determine which power cord is shipped. Note: A 1.8m (6ft) power cord (#9511) must be specified for use in Chicago, Illinois. Note: User must order RS-232 communication cable for RS-232 attachment. This till gives the customer flexibility to accommodate different size currencies. Coin and bill dividers are provided with the till, and can be adjusted up to 5 each. This till is for use with full size cash drawer features #3382 and #3383. A till cover is an optional feature (#6718) for the till and may be ordered separately. Provides a 83.8mm (3.3 in.) extension to the standard height display post. This post is for useful for increasing the display height particularly when the display needs to be seen above a tall device like a Printer. This till is adjustable to accommodate most major international size currencies and can be adjusted with up to seven currency slots and nine coin slots. It is for use with compact cash drawer features #3380 and #3381. A till cover is an optional feature (#6719) for the till and may be ordered separately. This till accommodates standard U.S. size currencies and had four adjustable currency slots and 5 coin slots. A till cover is an optional feature (#6719) for the till and may be ordered separately. Provides a compact size cash drawer with a vertical till insert. The till is adjustable to accommodate most major international size currencies and can be adjusted with up to seven currency slots and nine coin slots. A media slot accommodates approximately a 5.0mm stack of documents. The cash drawer dimensions are: Height 130mm (5.1")/Width 330mm (13.0"/Depth 475mm (18.7"). The cash drawer color is Storm Gray. Cash drawer opening is under program control, with support provided when the printer is attached via RS-232 interface on the following Operating Systems (see Software support section for details): DOS, Windows NT/3.1/95, OS/2. Extra vertical till inserts (#3369) may be ordered. Prerequisites: A lock insert (#9202 through 9211) or a non-operating lock plug (#9200) must be specified with the order. A short cash drawer cable (#3386) or a long cash drawer cable (#3387) must be ordered. Provides a compact size cash drawer with a horizontal till insert. The till accommodates standard U. S. size currencies and has four adjustable currency slots and 5 coin slots. A media slot accommodates approximately a 27.5mm stack of documents. The cash drawer dimensions are: Height 130mm (5.1")/Width 330mm (13.0"/Depth 475mm (18.7"). The cash drawer color is Storm Gray. Cash drawer opening is under program control, with support provided when the printer is attached via RS-232 interface on the following Operating Systems (see Software support section for details): DOS, Windows NT/3.1/95, OS/2. Extra horizontal till inserts (#3379) may be ordered. Provides a full size cash drawer with an adjustable till insert. The till gives the customer flexibility to configure the till to accommodate different sizes of currencies. A media slot accommodates approximately a 20mm (0.75 in.) stack of documents. The cash drawer dimensions are: Height 120mm (4.7")/Width 449mm (17.7"/Depth 475mm (18.7"). The cash drawer color is Storm Gray. Cash drawer opening is under program control, with support provided when the printer is attached via RS-232 interface on the following Operating Systems (see Software support section for details): DOS, Windows NT/3.1/95, OS/2. Extra adjustable till inserts (#1092) may be ordered. Provides a full size cash drawer with a fixed till insert. The till has five coin and bill compartments. A media slot accommodates approximately a 20mm (0.75 in.) stack of documents. The cash drawer dimensions are: Height 120mm (4.7")/Width 449mm (17.7"/Depth 475mm (18.7"). The cash drawer color is Storm Gray. Cash drawer opening is under program control, with support provided when the printer is attached via RS-232 interface on the following Operating Systems (see Software support section for details): DOS, Windows NT/3.1/95, OS/2. Extra fixed till inserts (#3879) may be ordered. Provides a cable for use when the cash drawer and printer are to be integrated. Prerequisites: One of the following cash drawer features: #3380, #3381, #3382, or #3383. Provides a 3.8M (12.5 FT) cable for use when the cash drawer and printer are to be distributed. Provides a lock for the cash drawer. The customer also has the choice of specifying a plug feature (#9200) instead of cash drawer lock features #9202 through #9211. Brackets used to mount cash drawers to the underside of a counter top. The till cover fits into the fixed till (#3879) or the adjustable till (#1092). The till cover fits into the horizontal till (#3379) or the vertical till (#3369). Provides a plug to cover the keylock opening when no keylock is desired. Provides a plastic panel which allows the SureMark printers (which are narrower than previous models) to be positioned on wide-footprint cash drawers. For use with point-of-sale I/O configurations using the I/O Integration Adapter Kit for Cash Drawer, feature #3375 on machine type 4693 and 4694 or specify code #9305 on 4695 or the standard system unit I/O integrated fence which ships with the 4694. This till has five fixed coin and bill compartments and is for use with full size cash drawer features #3382 and #3383. A till cover is an optional feature (#6718) for the till and may be ordered separately. Provides a cable for use with the SureMark printers when they are positioned on top of a system unit in an integrated configuration for RS-485 attachment to an IBM POS terminal model 4683, 4693, 4694, or 4695. Cables used to attach models 2, 3, 3R, 4, and 4R printers to 4683, 4693 or 4694 POS system may be used to attach the 4610 to these terminals. Provides a 3.8-m (12.5 ft) cable for use when the printer and system unit are to be distributed for RS-485 attachment to an IBM POS terminal model 4683, 4693, 4694, or 4695. Cables used to attach models 2, 3, 3R, 4, and 4R printers to 4683, 4693 or 4694 POS system may be used to attach the 4610 to these terminals. Provides a 2 meter (6.6 ft) cable for attaching the SureMark printer to an integrated system unit via the RS-232 interface. Provides a 4 meter (13.1 ft) cable for attaching the SureMark printer to a distributed system unit via the RS-232 interface. Provides a +24 VDC (3.0 amps) power supply for the SureMark printers when the RS-232 communication interface is in use. It connects to the printer via an 8-pin DIN connector. When the RS-485 interface is in use, power is supplied by the system unit and feature #4930 is not needed. This power supply is the only supported power supply for use with the SureMark printers and it should not be used with other devices. Maximum Number of Features: One per SureMark printer. Max orderable per printer: 99. Cable order: None. Power cords are provided based on country code of the order. Magnetic Head Cleaner Package (IBM P/N 73G2600) can be ordered through IBM Boulder. Lock Change Kit: Provides the ability to install and remove all standard locks. This is not needed for the optional cash drawer locks. For additional Lock Change Kits, order P/N 4783922. None required with the machine order. One roll of thermal paper and one ribbon cartridge are shipped with the product. The README file will include instructions for automating the download process. This allows large customers to initiate a download from a host rather than manually updating each printer. Each operating system platform (4690 OS, DOS and Windows) will provide the capability to download microcode and fonts. 4690 OS will not support the RS232 interface. (R), (TM), * Trademark or registered trademark of International Business Machines Corporation. or service mark of others.